The SousVide Supreme Vacuum Sealer, SVV-00300 is a countertop vacuum sealer which is specially designed for Sous Vide cooking. But you don’t have to use it strictly for this French style cooking; you can also use it as a simple vacuum sealing device for everyday household use. The most important feature of this sealing device is its easy touch-top activation that allows the user to simply push down the top to start the sealing process. The user-friendly control panel provides various settings which can be customized according to your needs. Helps in reducing freezer burns and spoilage of the food products. Can be used for preparing food for Sous Vide cooking. Option of sealing dry or wet food. Can be used to save space when camping or traveling. You can manually select settings required for any type of food depending upon whether it is dry or moist and whether it requires normal or gentle sealing. The powerful suction device of this machine completely removes the air from the bag without shrinking any of the bag’s contents. The vacuum created in the bag allows efficient heat transfer if employing the Sous Vide cooking technique. The SousVide Supreme Vacuum Sealer, SVV-00300 with 12 cooking pouches is currently priced around $130. 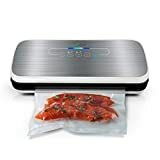 In addition to sealing meat and vegetables for Sous vide cooking, this SousVide Supreme vacuum sealer can be also used for vacuum sealing delicate foods without crushing them because of its gentler vacuum suction. You can also use this sealer to store fresh vegetables and fruits bought from the wholesale market, portion it out, and sealing them in vacuum sealed bags for added convenience. A unique feature with this device is its special moist setting that creates an extra strong seal to avoid accidental leakage of wet items. This SousVide Supreme vacuum sealer can be also used to protect important documents and papers. Don’t forget that you can also seal small items to take along during your outdoor activities like hiking and boating trips. The SousVide Supreme Vacuum Sealer measures 15″L 4″W 4.2″H and comes with multiple manual operational choices. This unit comes fitted with powerful piston pump for vacuum sealing along with a panel that allows you to choose several different settings depending on your needs. The design functions include fully automatic operation, moist/dry food settings and two adjustable speed settings. And if you wish to seal without a vacuum, simply choose the Seal Only button. The SousVide Supreme Vacuum Sealer, SVV-00300 is simple to use and comes with variable sealing options. All you have to do is place the items to be sealed inside the bag, open the lid of the machine, place the open end of the bag into the vacuum chamber under the air intake, push down the top with fairly firm pressure until it clicks, and release. The SousVide Supreme machine will start vacuum sealing once you have completed all those steps. Once the sealing is , the sealing light will go off. At this point, push the release button to open the top and remove the sealed bag. SousVide Supreme Vacuum Sealer, SVV-00300 doesn’t require a whole lot of maintenance. To avoid risk of electric shock, never put your machine in water. A damp cloth usually does the trick. The SousVide Supreme Vacuum Sealer, SVV-00300 comes with multiple speed controls for gentler vacuum suction of delicate foods, along with moist setting for an extra strong seal in case the food contains more than one and half tablespoons of liquid. But it’s not just for Sous Vide cooking—try it out small household products, jewelry and important documents. You’ll be pleased with how well it seals. For more Sous Vide vacuum sealer reviews, click here!